Navin is an independent filmmaker and web developer with a diverse background in communication, design and technology. He is founder and director of Devi Studios, a media production company with a diverse, international client base. 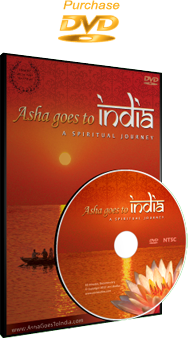 Asha goes to India is his first commercial release and in future films he plans to explore the intersection of spirituality, travel, sacred sites and the evolution of the human species. He holds a Master of Fine Arts (MFA) in Film and Electronic Media from American University, as well as a Masters in Public Communication. He was born in Canada to parents who immigrated from India, and currently resides in Seattle, USA. Asha is a school teacher living and teaching in Washington, DC. Her participation in this film fulfilled one of her life long dreams to travel through India. Asha is also an award-winning actress and voice talent who has performed since she was a child. She has appeared in numerous plays, public performances and films and won 3rd place (out of 40) in the Washington Theatre Festival for her solo performance of "Christ". She has trained at the Studio Theater, the Actor's Center, Howard University and many others. She holds a Masters in Education from American University. Ashish has a Masters of Fine Arts degree in Photography from Lucknow University. " But Cinema has influenced and taught me more than the college," he says. His sensibility is somewhere between documentary photography and photojournalism. His forte is his ability to find beauty in ordinary situations. He did the Still Photography for Mira Nair's Monsoon Wedding, and for ace film director Muzaffar Ali's Ek Cigarette & Mangala. He has done cinematography, still photography, and production work for several documentaries and promotional films for clients in India and abroad. As a journalist, screenwriter, creative director, and human being, Sarah has deeply explored transcultural spirituality and the evolution of the human species. Past projects include articles on Asian spirituality for the Rockefeller Foundation's Asia Society and feature articles on culture and art for the International Herald Tribune's Luxe Asia. As a screenwriter and creative director she develops media that implements innovative narrative approaches and technologies. The music for Asha goes to India is a soulful blend of East meets West fusion. These multi-talented artists seamlessly blend instruments like the sitar, tabla and guitar with their beautiful voices.